Collins English for Business: Speaking will help you make yourself understood in business. Model dialogues present key phrases to help you communicate effectively in different situations. You can choose to work on the units that are most relevant to you, or work through the whole book for a full course in business speaking. This brand new self-study book is the perfect way for business people who spend a lot of time on the phone or in meetings and want to improve their spoken English, getting their message across effectively. The focus is on the key language required to speak English accurately in business. Collins English for Business is a new series of self-study skills books which focus on the language you really need to do business in English ? wherever you are in the world. Each title includes tips on how to communicate effectively and how to communicate inter-culturally. Other titles in the series: Listening and Writing. Twenty 4-page units cover the key areas, such as Networking and Small Talk, Telephoning, Telephone and Video Conferencing, Presentations and Interviews. Clear navigation to key language in short, practical units. 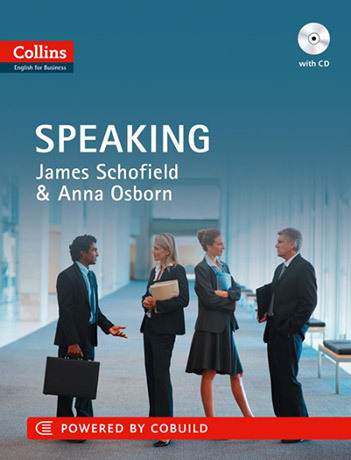 Audio CD: dialogues are recorded by native speakers, using real-life situations and key phrases specific to different situations in the business environment.